I have heard that the best way to defend yourself if you are attacked by a shark is to poke it in the eye. Someone said that this is a risky maneuver, trusting your life to a move that was invented by the Three Stooges! 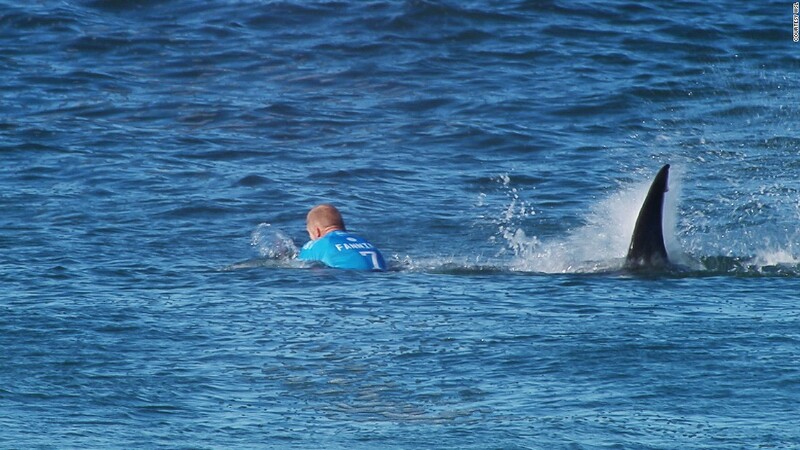 Australian surfer Mick Fanning had a chance to use his shark fighting skills Sunday. A large shark pursued Fanning during a competition in Jeffrey’s Bay, South Africa. The shark knocked Fanning off his board, and he punched at the creature to drive it away. Amazingly, he escaped the incident uninjured. The Bible says that the devil comes after us like a vicious predator, but all we have to do to fend him off is to stand firm in the faith. That sounds like a better plan than anything the Three Stooges ever came up with! “Be self-controlled and alert. Your enemy the devil prowls around like a roaring lion looking for someone to devour. Resist him, standing firm in the faith, because you know that your brothers throughout the world are undergoing the same kind of sufferings.”—1 Peter 5:8-9. This entry was posted in Christian Living, Current Events, Humor and tagged 1 Peter 5:8-9, devil like a roaring lion, illustration, Mick Fanning, resist the devil, shark attack, stand firm in the faith, surfer attacked by shark. Bookmark the permalink.